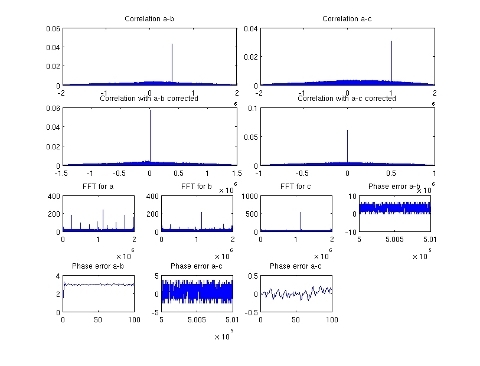 This paper explains the experiment done with multiple RTL2832u SDR receivers in order to create a multichannel receiver by using an unique HW clock source and signal correlations to obtain correction of the sampling deltas between the signals. 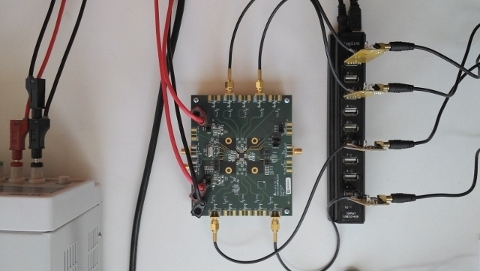 The need for a coherent multichannel receiver brought us to the idea of using multiple cheap RTL2832u SDR receivers in a system that will be phase coherent and will provide the user with access to multiple radio channels that can be used in subsequent signal processing algorithms requiring relatively high data rate per channel and in the same non continuous radio spectrum access. Direction Of Arrival (DOA) estimators. Multichannel receivers using frequency hopping like GSM. Multiple FM receivers for specific applications. 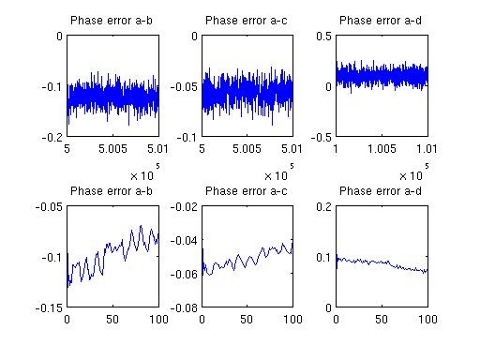 Scientific applications requiring phase coherent receivers. The experiment uses the CDCLVC1310-EVM board from TI that provides 10 output low jitter clock distribution system with selectable inputs from external clock sources or a local XTAL soldered on the board. The XTAL the board is equipped with, which is 25Mhz, has been replaced with one of 28.8Mhz XTALs that the RTL2832u usually has as default clock. The RTL2832u eats up 185mA when equipped with R820T tuner so a USB 2.0 hub with 10 sockets will need to have its own power supply to supply 185x10mA needed current. 2 x 8bit/sample x 2Msample/second * 10 SDRs = 320Mbit/s which is less than the theoretical maximum speed of USB2.0 that is 480Mbit/s. When the USB transfer is started for each receiver, there is no way to control the moment of acquisition of the samples relatively to the other receivers. 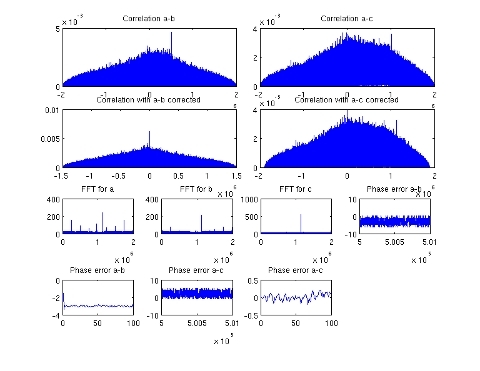 In order to still achieve the sample coherence between receivers a simple method of calculating the correlation between the channels signals is employed. 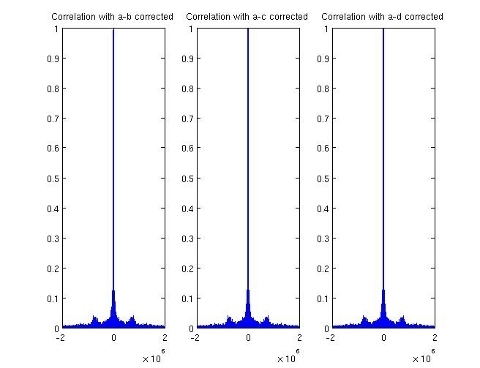 The correlations will have a peak where the samples are correlated and therefore one could calculate the time deltas in number of samples between the channels. Those time deltas are used to correct the stream timing from each of the receiver so that a synchronization in time is obtained. This assumes that once the USB transfer is started from a receiver, no sample will be lost and in general according to my observation this holds true on the PC systems I tested the project. A gnuradio GRC script has been used to acquire data from the SDRs then a Matlab script was used to do the math calculations. In a later step, a gnuradio block has been created to do all math calculations. Open input for three SDRs. In this case the environmental noise is available and so there is correlation between the signals but still the peak does not reach close to 1 as it should be in the case of a strong signal. FFT for four SDRs fed with a strong NBFM signal on 430Mhz, sample rate is at 1Msps as in all cases during this experiment. The use of RTL2832u SDR receiver in a multichannel coherent receiver proved to be successful and opens a new range of applications that are usually implemented with much more expensive HW. The drawbacks and limitations of the RTL2832u type SDRs like small dynamic range (given by 8bit/sample), instability with temperature, gain differences between different boards are also the limitations of the multichannel system as a whole. We tried to feed all the SDRs clocks from just one SDR an it worked fine for a system with 3 receivers maximum. Adding the fourth receiver destroyed the clock synchronization and that is the reason a clock distribution has been added. This is absolutely fantastic stuff. I’m struggling too with the problems you mentioned (instability of RTL-SDR sticks), it is especially frustrating when I just ask one stick to receive one single GSM-cell’s beacon channel and still I have hiccups and errors in my gsm_receive log, it’s never a consistent flow of data (for some minutes it works actually, but then it dies on me again). Do you have any tips or tricks how to stabilize it? Thanks a lot and keep up the great work! Hi Mario, the TI board works ok with the 28.8Mhz XTAL and probably will work ok also with a TCXO. 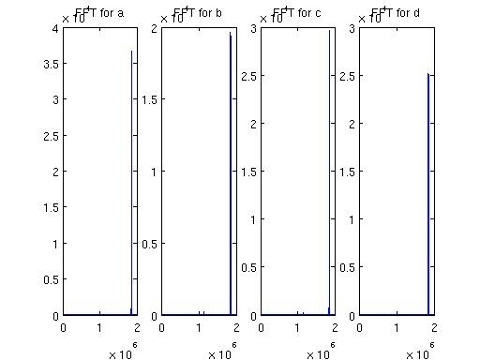 The stability of the board’s out clocks still depends on the stability of the input clock. In my case it was the phase difference that I was interested in and not the overall stability of the clock so as long as the out clocks are synchronized it does not matter how the clock is drifting (for my specific application). Still it could be different for you.